Professors from The Ohio State University at Mansfield lead small-group activities during Science Saturdays. Students in grades K-6 and their families can join in on hands-on, interactive science-related activities from 9 a.m. to noon April 21 at Springmill Learning Center, 1200 Nestor Dr.
Activities will be led by professors from The Ohio State University at Mansfield in the Springmill STEM galleries, which include Alternative Energy, CSI, Earth Studies, Feathers & Flight, Gears, Number Sense, and Ecology. Students in grades 4-6 and their families will participate in activities in three of the galleries. In recognition of Springmill Elementary School receiving the Ohio Department of Education designation of STEM school, students in grades K-3 and their families also will be able to participate in activities. Ohio State early childhood education majors will lead families in activities geared for that age group. A responsible adult must remain with students during the session. 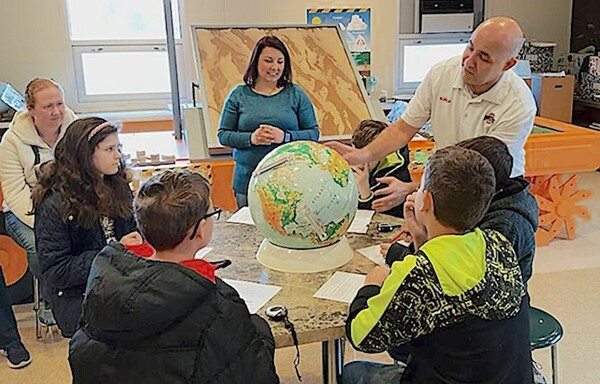 Science Saturdays is made possible through a partnership between the Mansfield City School District, The Ohio State University at Mansfield and through a grant by the Connections Fund with Richland County Foundation. Register at go.osu.edu/sciencesaturdays. For more information, call 419-755-4111. About Springmill Learning Center: Mansfield City School District’s Springmill Learning Center (SLC) is a series of STEM-based galleries with interactive activities for students in grades K-12 based on Ohio’s academic standards. Through a partnership between Mansfield City Schools and The Ohio State University at Mansfield, the Center offers classroom extended learning opportunities for area school districts, out-of-school outreach activities for students and parents, and professional development for teachers. The goal of SLC is to offer high quality, experience-based and inquiry learning in the state of Ohio, and to encourage students to further explore interests in potential STEM careers.